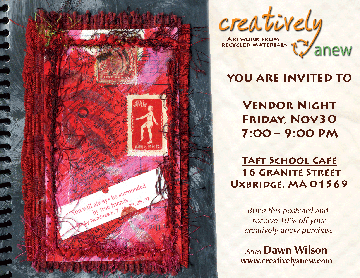 The Taft School located at 16 Granite Street in Uxbridge, MA is having it's first ever Vendor Fair to benefit the Uxbridge Special Education PAC for Uxbridge Schools. Creatively Anew will have journals, NEW fabric scarves made from lush fabrics, bottle cap necklaces, collage tins, and mini-art quilts available for purchase. Come and visit the show and mention this blog post and you will receive 10% off your Creatively Anew purchase. Featuring handmade holiday cards, gift tags and journals by Boston Handmade member Jessica of Reclaimed To You and jewelry made by Etsy seller Little Wishes. This trunk show is conveniently located right next to the Commuter Rail and the show venue has parking available. And THIS WEEKEND CRAFTLAND begins in Providence, RI and will feature work by several members of Boston Handmade including Elizabeth Brennick Designs, Mimi K, and Pogibabies. Craftland rund from December 1st through the 22nd. See www.craftlandshow.com for details about show times and directions. Craftland 2007 features an eclectic assortment of fine craft and handmade kitsch by more than 150 artists and craftspeople from Providence and beyond. Discover fresh and funky gifts for the home, your uncle, the wardrobe, the kids, and even yourself! New treats like holiday ornaments, felted jewelry, handmade neckties, cozy knit wear, silk screened stationery, one of a kind wearables, ceramic dishware, original prints & paintings, pet toys, fresh comic books, DIY kits, unique stuffed animals, oodles of stocking stuffers, and so very much more. Stop by and be surprised!